To celebrate the upcoming entire month of November and all it means for us writers, we YA Buccaneers thought it would be fun to host a NaNoWriMo Treasure Hunt! And what exactly does that entail? 1. Each YA Buccaneer crew member will post a tip on how to navigate the high seas of NaNo on their own personal blogs. 2. Anyone who would like to join us will simply hop from blog to blog to read all the great NaNo tips. We'll make sure to provide a link to the next blog you hop to! 3. Leave a comment on each blog. 4. Enter your name on the RaffleCopter widget at the bottom of each post -- the more blogs you visit = more entries to win! And voila! 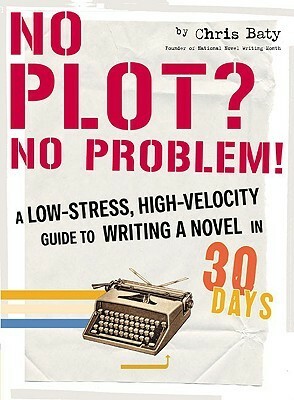 You're entered in our treasure hunt to win a copy of NO PLOT? NO PROBLEM by Chris Baty -- an excellent guide to help you with your MS during the 30 days of NaNo! So, my NaNo tip for the Treasure Hunt? Don't get caught up in the small stuff. NaNoWriMo is a time for unabashed writing...not editing. There will be time for that later! All you need to focus on during this time is writing. Getting all those crazy words in your head, down on paper. Yes, some of it will be trashed later. Yes, some of it will be completely unusable. But yes, some of it will actually stick when all is said and done. The point of NaNo is to write. So don't sweat the small stuff...that's all fixable later. I'd love to hear your thoughts on NaNo - will you be entering this year? Do you have any tips you'd like to share? Drop a note in my comments below -- and don't forget to enter your name in the RaffleCopter widget to win! For your next stop on the NaNoWriMo Treasure Hunt, please hop on over to The Dread Pirate B's blog for her advice on conquering NaNo this year! Stop by the YA Buccaneers to catch up on any blogs you may have missed, too! I hope to see you around the NaNo-sphere next month! Newer PostWherein I Get To Write THAT POST!